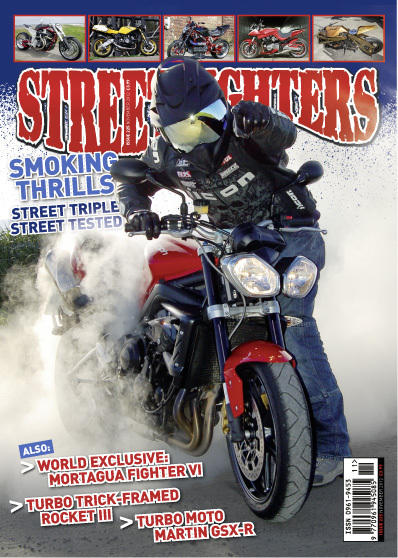 Streetfighters 225 is on its way to subscribers now, and will be on newsagents' shelves next week. As you can see from the cover, the new issue features a Street Tested article on Triumph's Street Triple R, but there's plenty of modified bikes too, naturally. From a Toxic FireBlade from north of the Border, via a (very) radical Yamaha MT-01 and a turbocharged Triumph Rocket 3, through to a cafe racer Norley and the new machine from bonkers-barmy Portuguese builder, Mortagua. there's also reports from the World Wheelie meeting, and the stunt competition at Brent Cross, and stacks more.